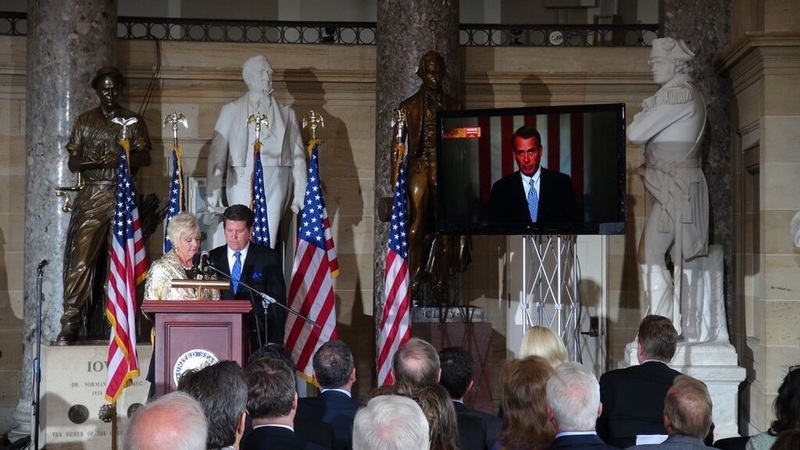 "From the moment Speaker Boehner graciously complied, doors began to swing open, and a Divine, centuries-old connection was restored." We agree that America needs a move of God. What better place to make an appeal to Heaven than from the seat of the people’s power—Congress? On Wednesday, April 27, Speaker Paul Ryan will give the opening welcome, and Honorary Hosts Senator John Boozman and Representative Cathy McMorris Rodgers will join over 40 members of Congress in leading the nation in prayers from the U.S. Capitol's Statuary Hall for a fresh move of God upon America. Four years running, Congressional representatives have joined pastors in an annual prayer meeting for America. Called Washington, A Man of Prayer, it comes to us from the Capitol Building in Washington, D.C. The inspiration for this yearly gathering began when a pastor from a church in “anywhere America” saw Messianic Rabbi Jonathan Cahn on television before his best-selling book “The Harbinger was published. Cahn compared the Biblical warnings given to ancient Israel by God to modern-day America, and how we, too stand at the crosshairs of disaster should we continue to spurn our covenantal relationship with our Maker. Catching the vision laid out by Rabbi Cahn, Pastor Dan felt compelled to pray. Travelling to Washington from Bridlewood Church in Bullard, Texas, Pastor Dan approached then Speaker of the House John Boehner to ask permission to hold a prayer meeting in Statuary Hall, the old chamber of the House of Representatives in the Capitol building. From the moment Speaker Boehner graciously complied, doors began to swing open, and a Divine, centuries-old connection was restored. Washington, A Man of Prayer commemorates events of April 30, 1789, when after being sworn in at Federal Hall in New York City, President Washington, accompanied by Congress, proceeded to St. Paul’s Chapel. One of his first official acts as president and one of the first official acts of the first Congress was to offer prayers of dedication to God on America’s behalf. Each year, Washington, A Man of Prayer is held in prestigious Statuary Hall, formerly the Old House Chamber, which was the location of weekly Christian church services from 1807 to 1869. “It was actually the largest church on the east coast,” Pastor Dan comments. “Legislation allowing that use was passed on a floor motion by the House and Senate chaplains. President Thomas Jefferson attended these Sunday services as did President Adams after him. And, we are all invited to watch and participate. “Washington, A Man of Prayer will be available via Daystar Television Network and internet streaming proudly provided by WND.com to homes and churches all across America,” notes Pastor Dan. “Your Church can stream this event in your midweek service on Wednesday, April 27, beginning 6:30pm ET. All time zones will be able to start the event from its beginning to accommodate your church starting time. Or, watch it live on Daystar Television Network from 8:30pm-10:00pm ET.